1- STELLA LEVITT "Note so high"
2- FLORIAN PELLISSIER QUINTET "J'ai du rêver"
3- WEBSTER WRAIGHT ENSEMBLE "Nature and light"
5- GUTS "life like good music never dies"
7- Baron Rétif & Concepción Perez - "Blind Lemon"
8- DOPEGEMS "It's your love"
9- GUTS "Brand new revolution"
10- THE COOPERS "Acapulco, dos de la tard"
11- THE RONGETZ FOUNDATION "Sam's intro"
12 - BOBBY FEW "Everybody has the right to be free"
13- CHENE NOIR "Le chant du cirque"
Like every season, Heavenly sweetness offers a retrospective of the releases of the year just past but also a taste of what will come out next year and as Christmas gift unreleased tracks. For the third digital sampler, we can find Stella Levitt “Note so high” (from FREEDOM JAZZ FRANCE), GUT’s hit single “Brand New revolution”, “Muscles” the twisted beats by Bonnie Banane (from DIGGING THE BLOGOSPHERE 2), The Coppers (from BEACH DIGGIN’), “Nature and light” from the great big bang jazz album by WEBSTER WRAIGHT ENSEMBLE, and “Sam’s intro” our favourite track out of RONGETZ FOUNDATION last album. But let’s go for the news : EXCLUSIVE !!! “Tamarind” the first track out of the new ANTHONY JOSEPH’s album (composed and produced by Meshell Ndegeocello), an unreleased track by GUTS (just for this sampler) , the first song from FREEDOM JAZZ FRANCE 2 Bobby Few “Everybody has the right to be free”, one track from CHENE NOIR (check the reissue of 2 albums next year), One song by our new signature FLORIAN PELLISSIER QUINTET, deep jazz from Paris, and an unreleased track by another new signed band, the mighty BARON RETIF & CONCEPCION PEREZ. And last but not least, the cover of “It’s your love” by DOPEGEMS. Enjoy and be ready for next year!!! 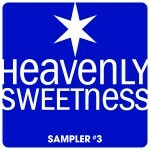 Comme chaque fin d’année, Heavenly sweetness vous propose une retrospective des sorties de l’année qui vient de s’écouler mais surtout un avant gout de ce qui va sortir l’annnée prochaine et en cadeau des inédits.